Ventline Roof Vents are radius cornered, 14" x 14" and have a high-profile polypropylene cover in white with a white screen frame. 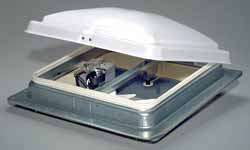 They are available non-powered or with a 12 volt or 110 volt exhaust fan. Garnish sold separately for the powered vents.